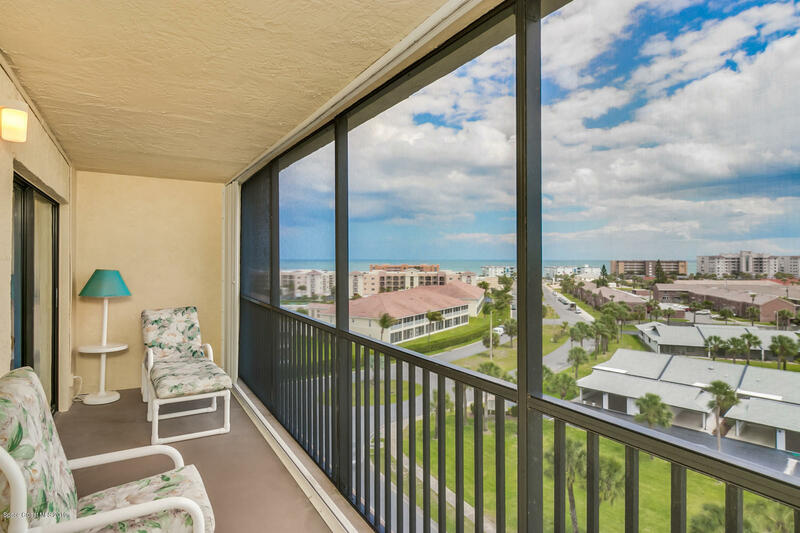 BREATHTAKING OCEAN AND RIVER VIEWS FROM THIS TOP FLOOR CONDO! WALK TO THE BEACH! RELAX ON SCREEN IN BALCONY AND ENJOY THE AERIAL VIEWS! 2 BEDROOM, 1.5 BATH WITH SPLIT BEDROOM PLAN!KITCHEN UPDATED IN 2015 WITH NEW CABINETS, QUARTZ, AND APPLIANCES! A/C 2013! WOOD LAMINATE FLOORS THROUGHOUT EXCEPT WET AREAS! TRANSFERABLE HOME WARRANTY! CONCRETE RESTORATION COMPLETED IN 2018! ADDITIONAL STORAGE! COVERED PARKING! HURRY, WON'T LAST!